Existence Artistique (Angers, France) on 29 June 2018 in Miscellaneous and Portfolio. Beautiful light and great capture of the telephone addict. Ici aussi, on capte bien! I like how you capture these 'moments' . . click and they are gone ! Une belle lumière descend et remonte l'escalier et l'ensemble, ça marche! Bonne journée lumineuse! An interesting street scene of the couple. 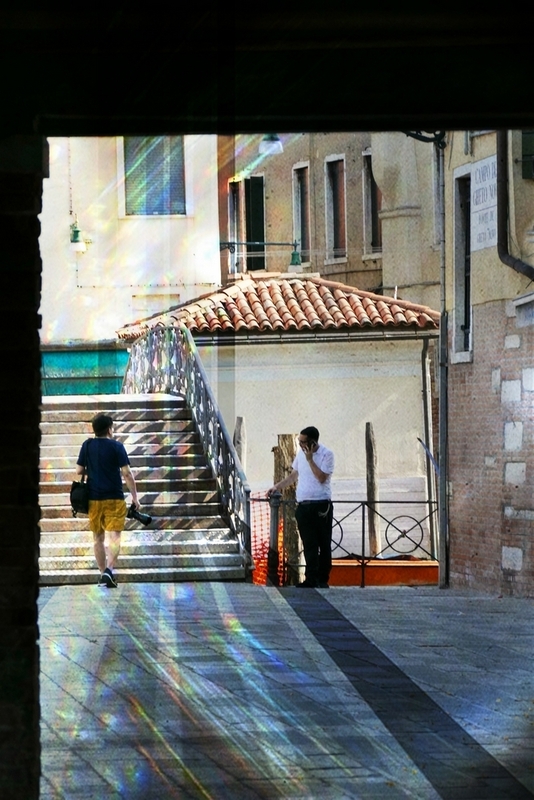 The refracted light adds much to the picture's interest. Ceremony of colors in a fantastic shot. Ha ha, he's still on the phone. Wonderful ribbons of rainbow light captured here. Quelle traces lumineuse et personnages quelle vue et compo superb vue. Magnifique lumière et couleur. Toujours au téléphone! The camera and the phone should have a duel.